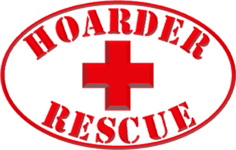 Hoarder Rescue strives to complete each job with expertise, privacy and individual care. Thank you to our valued customers for these thoughtful testimonials. Hoarder Rescue is always happy to have extremely satisfied customers. After over 40 years at the same location, our family business closed its doors for retirement. The storage rooms were so full, it was overwhelming. There were boxes and items stacked to the ceiling that hadn’t been touched in decades. I didn’t know where to begin. A very heartfelt thank you to Roxanne and her amazing staff, Ellen, Billy and James for lifting our burden. Hoarder Rescue changed my mother-in-laws life; she was withdrawn and embarrassed and we could never bring her grandchildren to her home or even her yard. Now they play in her yard and there is room inside where they can play with the special toys she had saved for them and they love it! Thank you so much for bringing these sweet memories into being!! My elderly Aunt is a hoarder. Her safety became an issue with all of the excessive clutter and a really bad fall, that ended with a broken hip. She finally allowed us to find her help. The Hoarder Rescue team was very understanding, personable and discreet. They have been a blessing to our family. Thank you and God bless!